Acupuncture is a holistic form of medicine that has been used for healing purposes throughout many centuries. The ancient Chinese healing art uses very fine needles to improve the flow of qi, otherwise known as life force energy. Acupuncturists are in tune with the body’s energy channels. This enables them to not only address physical issues that a person may be experiencing, but also the emotional or spiritual concerns that one may have. Because acupuncture can be used for a wide variety of needs, many people find that acupuncture helps to resolve multiple concerns, including some they didn’t expect to improve from acupuncture. Acupuncture is most commonly recognized for use in general or chronic pain management. While it certainly helps people with these needs, acupuncture can also help patients experience relief from many more physical and emotional issues. Portland naturopaths and licensed acupuncturists are able to help those suffering from anxiety and depression by working with neurotransmitters such as dopamine and serotonin to aid in improving mood. As many as 33% of those affected by depression seek treatment through acupuncture. Additionally, acupuncture helps decrease the symptoms of insomnia for patients. 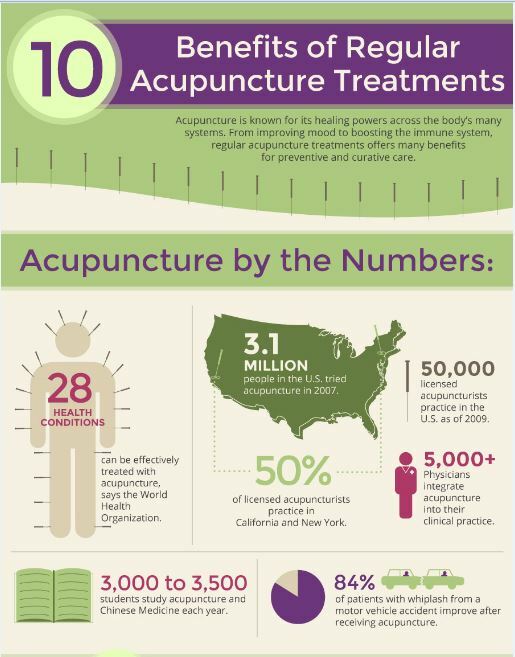 Many people also find that acupuncture can help improve the immune system, hormone balance, reduce allergies, and help with weight loss management. Contact Heart Spring Health today to learn more about how you can make an appointment with Portland-based naturopathic health clinic. This entry was posted in Acupuncture, Infographics and tagged acupuncture portland, portland naturopaths.